Does your daily commute include a trip to, from, or through Burbank? Here at the BTMO we pay close attention to transportation projects and have created this list of current and future projects impacting commutes into and out of Burbank. The list includes information on projects coordinated by Caltrans, Metro, and the City of Burbank. These projects are constantly evolving so please check back here where we’ll track progress and post updates. If you have questions or want personalized trip planning assistance, you can always Contact Us! Project Summary: A new Interchange at I-5 and Empire Avenue will improve pedestrian and cyclist accessibility and separate the railroad crossing for safety. Closures may be intermittent and ongoing throughout the end of the project. Project Summary: Completely reconstructed overpass at I-5 and Burbank Boulevard. Construction will also improve the intersection of San Fernando Boulevard/Victory Place at Lincoln St. I-5 Access ramps will be closed through the duration of this project. The following Metro projects impacting Burbank commuters are on Metro’s shortlist of projects to be completed before the 2028 Olympic Games. Find the whole list here. Phase: Technical Study – Alternatives Analysis should be finished by the end of 2019. 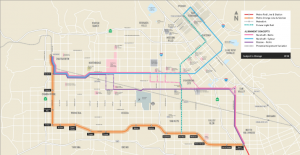 Project Description: As proposed, the project would be a 16-mile-long regional connection between San Fernando Valley and San Gabriel Valley. This project would include dedicated bus lanes, transit signal priority, frequent stops, branded vehicles and stations, real time bus arrival information and other features to enhance performance and comfort above local bus service. 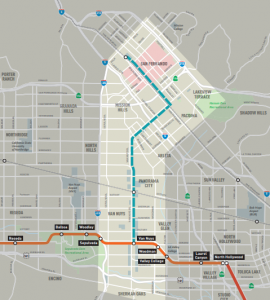 Project Description: This Light Rail Project will extend north from the Van Nuys Metro Orange Line station, to the Sylmar/San Fernando Metrolink Station, a total of 9.2 miles. The alignment will include 14 at-grade stations with an end-to-end travel time of 31 minutes. Project Description: Metro is evaluating potential BRT alignments and station locations through an Alternatives Analysis to identify a proposed project for the North SFV corridor. Metro anticipates an 18- to 20-mile route will be selected for Bus Rapid Transit (BRT) improvements in the Northern San Fernando Valley. 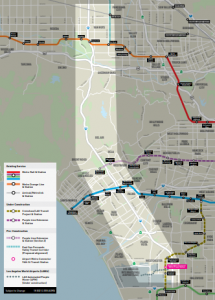 Project Description: Metro is identifying and evaluating rail transit alternatives between the San Fernando Valley and LAX, including connections to existing and planned Metro bus and rail lines such as the Orange, Purple, and Expo Lines. Various alignments and station locations will be considered for the rail alternatives. The feasibility study will be completed in Fall 2019. Project Description: 14-gate replacement passenger terminal that is further from the runways and meets current earthquake design standards. The replacement passenger terminal will provide access via Metrolink North/South Stations that air travelers enjoy while providing greater user amenities. Project Description: The Burbank Center Specific Plan has not been updated since it was originally created in 1997, over 20 years ago. Metro has awarded the City of Burbank a $410,000 TOD Planning Grant (with City match) to update this plan and associated elements of the City’s General Plan. Project Description: The proposed streetcar would serve residential and commercial neighborhoods between the Larry Zarian Transportation Center, Downtown Glendale, and possibly Downtown Burbank and Hollywood Burbank Airport. Project Description: Phase I of the Project was completed in 2011 and extends from Victory Boulevard to Alameda Avenue. The City of Burbank is completing the design for Phase II of the project, which would extend the path from Alameda Avenue to the Downtown Burbank Metrolink Station. Construction of Phase II is projected to begin in spring 2018 and be completed by the end of 2019. Measure M: Funding for new projects through Measure M is subject to the Arroyo Verdugo Communities JPA. A project list can be found here.